Before you deep clean a carpet you should look for a reliable commercial vacuum to get up most of the debris before you do your deep cleaning. When you are vacuuming, it helps to have the right tool for the job. With our extensive line of commercial grade vacuums, it is easy to match the features you need to the job. Our upright vacuums feature heavy-duty low profile housing and wide furniture guards to protect the unit and surroundings during use. Everyone has a preference when it comes to vacuum bags so we made it easy. Most of our models come in either a Vacucide, treated shake out bag model or with the Enviro-Clean, high filtration paper bag. We also offer a heavy duty dirt cup model for fast, simple and clean waste disposal. For when it is necessary to keep the noise to a minimum, our lightweight vacuums feature a clean air filtration system that operates powerfully, yet quietly with the Silent Run System. Our commercial line of wide vacuums are completed with a wide area sweeper model and a convenient back pack vacuum. We know your requirements are varied so we offer models in every price range and with a wide range of features so that you can choose the equipment that best fits your specific requirements. Wide Area Vacuum — 30 inch Cleaning Path! Cleaning large carpeted areas can be a challenge but our wide vacuums make the job a lot more manageable. 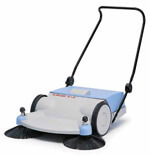 It’s 30 inch cleaning path does the work of 3 vacuums, and its two powerful vacuum motors, which deliver 234 CFM, pull the smallest dust and debris from the carpet. Once the dust and debris is removed it has to pass through a 4 stage filtration system that will filter 98.6% of the particles down to .3 microns. 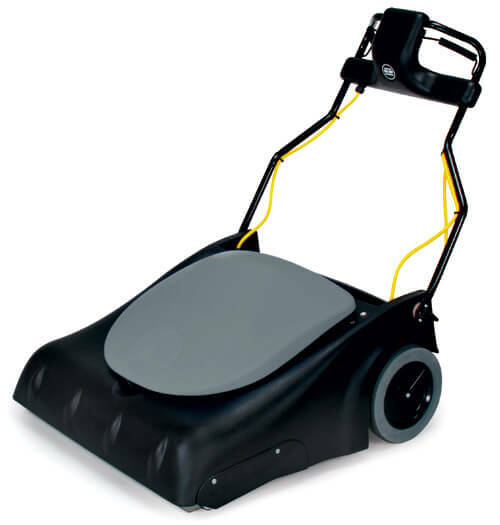 This wide vacuum is a feature packed and powerful wide area vacuum that will help you tackle the largest of carpeted areas. 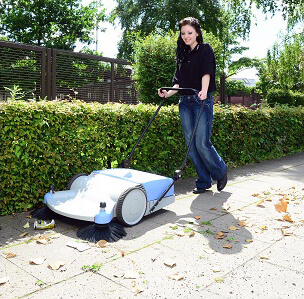 The push sweeper can pick up larger debris like soda cans, trash, dirt, and other types of litter of any indoor or outdoor hard surface. While you push the sweeper, the wheels turn the four brushes that push the dirt away from the edge of a wall towards the center where it is then scooped up by two rotating brushes underneath. The faster you push, the faster the brushes spin! There are filters in the storage bin to keep dust from escaping. When the user is done, they just lift off the bin and empty the sweeper. No electricity needed, uses gear driven push power! We have comprehensive line of extractors like self contained carpet extractor, upright and heated upright carpet extractors that can handle any job from auto detailing to heavy-duty carpet cleaning.